P.H. 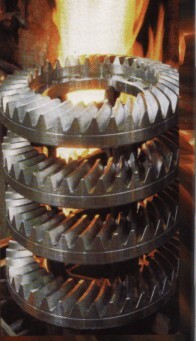 Heat Treatment is one of the oldest commercial metal heat treatment companies in South Africa. It was founded in 1956 and has provided an essential service to industry for 48 years. Through its long history, it has gained a wealth of experience in ferrous and non-ferrous heat treatment and in addition to having a graduate metallurgical engineer as its managing director, the corporation prides itself in being South Africa's expert in the use of gas atmospheres in heat treatment, being endorsed by BOC Gases (Afrox). As a result of its heat treatment atmosphere expertise, it can offer industry a host of heat treatment processes, designed to obtain the most out of metals and alloys, particularly steel. These processes offered by P.H. include gas carburising, carbonitriding and other case hardening processes as well as neutral hardening and tempering, carbon restoration, normalising, etc. P.H. is the only South African heat treatment organisation to offer certain copyrighted processes under licence to the U.K., such as Alpha, Alpha Plus, Beta, etc. which allow steels to withstand wear and corrosion.